I like to make bread, better yet, eating a slice of hot homemade bread fresh from the oven. There are so many recipes available for breads of all flavors, it is hard to adapt or change. However, I am always inspired to try again. 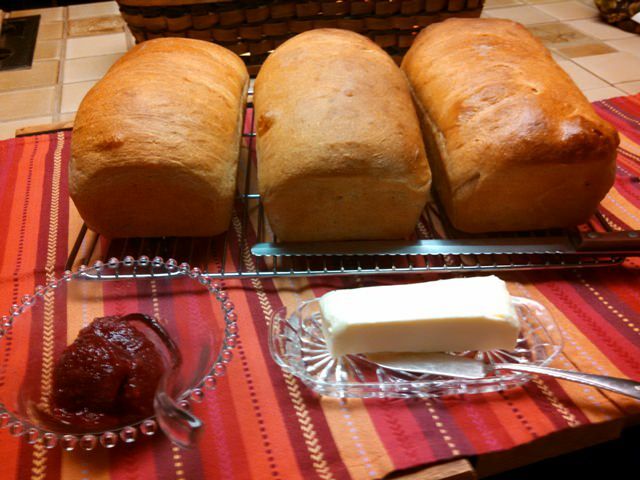 This recipe was adapted from The Fannie Farmer Cookbook, 1996, Whole Wheat Bread. The first recipe made one loaf. It was small and did not last long, it was too good to last. The recipe was for bread pan of 8 1/2 x 4 1/2 x 2 1/2 inches. All the bread pans I have are 9 x 5 x 3 inches. Using those pans, I doubled the recipe and got 3 large loaves of bread. Honey Whole Wheat Bread dough kneaded and resting. That is a mixture of 4 cups of whole wheat flour and 7-8 cups of unbleached all-purpose flour. This has the salt, yeast, milk, water, honey and olive oil added and has been kneaded. Now it is resting 10 minutes after the first kneading. Then it will be kneaded another 10 minutes. I can hear the “WHAT? 20 minutes of kneading and then it has to rise two time for hours!” That is why I am baking bread since I retired. I didn’t have time and energy back then either. So next…. 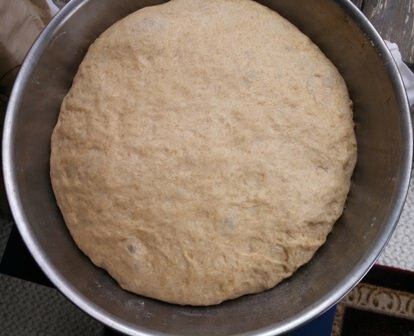 After it has been thoroughly kneaded to smooth and elastic and rolled in a ball, I put it in a large oiled pan, oil the dough and let it set in a warm spot for 1 hour. A dish towel is used to cover the dough. Oiling the dough before first rise. Honey Wheat Bread dough double in size. Pour the dough out on a floured bread board , cut dough into 3 pieces, make balls of each to shape into 3 loaves of bread. Shaping of loaves is explained in the recipe below. Put dough in greased bread pans butter top with melted butter if you prefer a soft crust. Set pans in warm place, cover and let rise about 45 minutes. They will not be doubled in size. 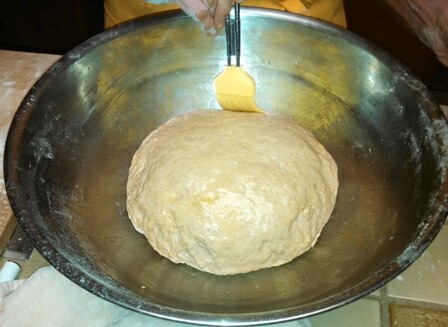 Honey Whole Wheat dough ready to rise into loaves. I bake it for about 45 minutes. If they brown too much on top, I cover with aluminum foil. The bread will have pulled away from the sides when done. After taking the bread out of the pans, tap on the bottom, it should sound hollow. I like to set the loaves directly on the oven-grate shelf for additional 5-8 minutes. This gives it a final crisping. The oven can be turned off at this step. Our preference is for soft bread crusts. After the bread has been removed to the racks to cool, I brush melted butter over the tops and sides of the loaves. While they are cooling, the loaves of bread are covered with a dish towel to cool completely. Now they are ready for cutting and tasting! Unless you can eat your bread within a day, it is best to freeze the excess. 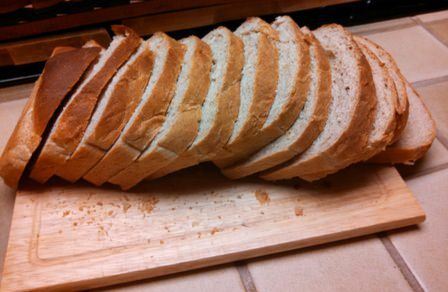 I cut the bread with an electric knife into 16 slices. I wrap 8 slices, half loaves, in aluminum foil and in a plastic bag or freezer paper and freeze. When ready for another half loaf, I set the oven at 350 F, put the loaf in the oven while frozen for 30 minutes. This makes soft bread and if kept in the foil and plastic bag will last 2 days, if you haven’t eaten it. An all-purpose sweet whole wheat bread for peanut and butter sandwiches, french toast or bread pudding.. Mix water and milk in sauce pan or in microwave to heat to 115 F.
Pour into large mixing bowl, add olive oil, honey, sea salt. 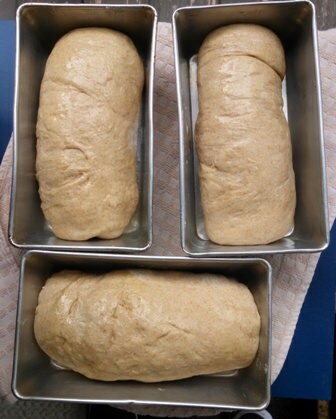 Let cool to 105 F.
Measure the flours: sift together 4 cups of whole wheat and 4 cups of unbleached all-purpose flour. 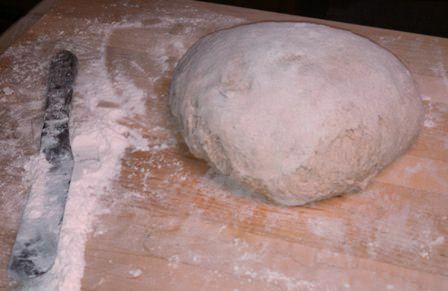 Reserve another 4 cups of the white flour for flouring the bread board and kneading. Heat 1 cup warm water to 102-105 F, add the yeast. Stir to dissolve yeast, it will become foamy and small bubbles on surface of water. Let set 5-8 minutes to allow yeast to proof, become active. Pour yeast into the 105 F seasoned milk/water mixture. Add 4 cups of blended flour, beat thoroughly. Add remaining blended flour, beat together until dough sticks together. Using reserved flour, lightly flour bread board. Pour out the dough, flour hands, knead together until dough handles easily. Let rest for 10 minutes on bread board. Resume kneading for 10 minutes, adding more flour to keep from sticking on board. Oil large bowl, roll dough into a ball, oil the dough with a brush. Cover bowl, place in warm, 75-85 F place to rise until double in bulk, about 1 hour. Do not disturb during rise time. Grease 3 9 x 5½ x 3 inch pans. When finger is pressed into dough leaving an indention, it is ready to be punch down with fists allowing the gases escape. Pour on lightly floured board, cut into 3 equal parts. Roll each into a ball, let rest. Roll each ball into a 9 x 12 rectangle, starting at the 9 inch end, roll up, pinch the ends on seam together, putting the seam on the bottom. Put into the greased loaf pans, ends touching the pans. Lightly grease tops of the bread for a soft crust. Cover the pans and set in warm place to rise for 45 minutes. At the end of second rise, put into oven to bake about 45 minutes. Put foil over top of bread if browning too quickly. Bread is done when removed it will sound hollow when tapped on the bottom. Adapted from Cunningham, Marion. The Fannie Farmer Cookbook, 1996, p 516. Julia Ann and cookbookinabox® in partnership with Netta Belle’s Choice® bring you great recipes for your cooking experience. ©2007-2018 Netta Belle’s Choice® cookbookinabox® “Reg. U.S. Pat. & Trdmk.Off.” Reg. “Trade-marks Canadian Intellectual Property Office. nettabelleschoice.com and cookbookinabox.com. All rights reserved. I admit this is a long day of bread making, particularly if you have never tried your own bread. BUT it is sooooooo, worth it. Enjoy. Finished last loaf, time to make another 3 loaves. Tomorrow! This entry was posted in Breads and tagged bread, honey, unbleached all-purpose flour, whole wheat flour, yeast on February 2, 2017 by Julia Ann.